It’s hard, sometimes, to make sure you have absolutely everything you need for your baby. Toys, formula, playpens, bouncers; you need to shop for all these things and more, and two important pieces of equipment are, of course, strollers and car seats. 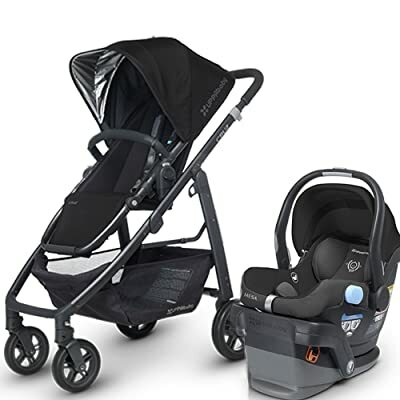 A particularly useful product that helps with this is a travel system stroller, which combines a car seat and a stroller into one multi-purpose product that saves you the trouble of having to search for and purchase both a car seat and a stroller. In any case, these travel systems can be incredibly useful and beneficial. But as with all important purchases, it’s better to be well-informed before you go out to invest in a travel system stroller of your own. With that in mind, we’ve compiled both some information on travel system strollers for you, as well as a list of our top 8 best travel systems strollers, to help you narrow down your search and find the right product for you and your baby. First of all, let’s discuss the benefits and drawbacks of travel system strollers and why they may or may not be a good choice for you and your child. As with most things, there are both positives and negatives to having and using a travel system stroller for your child. To help you gain a better understanding of how these travel systems function, we’ve broken down the pros and cons for you. The most obvious benefit of having a travel system is that it is a combination of both a stroller and a car seat. Not only does the seat fit comfortably in pretty much any vehicle, it attaches securely and seamlessly to the stroller portion, allowing you to transition from driving to walking with ease. Overall, this unique two-in-one design allows you to save time, space, and money all at once. Time – Because now you won’t have to spend an extra five or ten minutes taking your child out of their car seat and transferring them into their stroller (and who are we kidding, depending on your child’s mood, this could be a twenty minute ordeal rather than a five minute one). Space – Because if you’re using a travel system you won’t need to be packing around both a stroller and a car seat wherever you go; you just have the travel system stroller, which is significantly more compact. Money – Because you are buying just one product (the travel system stroller) instead of two (a car seat and a stroller). And since raising a child is an expensive endeavor, saving money wherever you can is definitely ideal. The main drawback to a travel system stroller is that no matter which brand you buy, they do tend to be a bit on the expensive side. Typically such an investment is worth it for the assistance it provides, but if you’re on a tight budget then a travel system stroller might not be right for you. Also, some strollers are a bit bulky, even when they fold down; this can make it difficult to utilize one if you driver a small or compact car that doesn’t have a lot of storage room. Certain travel system strollers can also be heavy and hard to lift. It’s important to consider both what the wheels of the stroller portion are made of, and how many there are. Some strollers come with four wheels, while others have only three. A stroller with just three wheels is more maneuverable, while ones with four wheels are more stable. As for wheel material, rubber tires filled with air provide a smoother ride for your child, whereas plastic tires are more durable and can handle rougher terrain but also make for a rougher ride for your baby. The effectiveness and safety level of the car seat portion of your travel system is probably the most important factor to consider. Your baby, after all, is dependent upon this car seat to keep them safe while you’re driving. Make sure the seat is properly padded with soft foam and cloth and has a secure safety harness to keep your child comfortable and safe while in the car. Also make sure that the car seat portion connects securely and easily to the car seat base; if the seat wobbles or seems unsteady, don’t trust it; your baby’s safety is the topmost priority. As mentioned previously, a travel system stroller can either be reasonably priced or ridiculously expensive depending on the brand and style you choose. It’s important to bear in mind, though that while you don’t want to break the bank buying a travel system stroller, a cheaper option is probably going to be made of cheaper materials, and will likely not last as long as a more expensive but sturdier option. There are a wide variety of travel systems out there to choose from, all with different features and perks. To help you narrow down your choices, we’ve compiled a list containing eight of the best travel system strollers currently available on the market. This travel system includes the Bravo stroller, Key Fit 30 Infant Car seat, and the car seat base. The stroller portion comes with a seat of its own, but this seat it easy to remove and replace with the Key Fit seat, which helps when transition your child from your car to their stroller. The stroller portion is also incredibly easy to use, with auto-positioning wheels. It is also easy to open up, and can even be opened with one hand if necessary; it is similarly easy to put away, and will even stand upright in its compact form. The most appealing aspect of this stroller is that it can be used during almost all stages of your child’s development; the car seat can also function as a carrier during your baby’s younger years and snap easily into the stroller frame, and once they’re old enough to sit up on their own more, they can use the stroller on its own without the Key Fit car seat/carrier installed. There is also a helpful tray attached to the stroller that has cup holders and storage containers that can be used for drinks, snacks, and whatever other small items you might need when out with your baby. It’s also available in five different color schemes. Designed to be used with a baby of any age, this travel system includes a jogging stroller and an infant car seat with an EZ Flex-Loc base. The stroller portion has a well-padded seat that reclines with adjustable positions; it also has a five-point safety harness, a very important feature. This stroller (as a jogger-type) has three wheels, two at the back and one up front. The wheels are made of durable all-terrain materials and are very similar to bicycle tires, simply sized slightly smaller (the two back wheels are sixteen inches across, while the single front wheel is twelve inches across). The front wheel is also lockable, allowing you to keep your stroller in one place without risk of it rolling away while you attend to your baby. The front wheel also swivels, allowing for extra maneuverability, which is always helpful whether you’re just going down the sidewalk or trying to navigate the skinny aisles in a supermarket. The attached tray on the stroller comes with two cup-holders, and there is an additional storage compartment on the underside of the stroller for any additional items you might need to carry with you. This product is also available in nine different color schemes. This travel system is notable for its stylish design that also puts a strong emphasis on safety, particularly for smaller infants. The car seat portion of this travel system utilizes a secure five-point safety harness that can be used even by very young, small, or premature infants, has special side impact protection built in, has good head and neck support for young babies, and also has 17% more leg room when compared to other types of car seats. The stroller portion has four sturdy wheels, an adjustable canopy with a mesh panel that provides additional airflow, an attached tray above the stroller with two cup holders and a storage compartment, a smaller tray for your child, and an easy to access basket underneath the stroller itself. The handles on both the car seat/carrier and the stroller utilize a special curved design to make it more ergonomic, and the stroller is also incredibly easy to fold up and store away, making it a good choice if you lead an active lifestyle with your child. This travel system is a popular choice among parents and caregivers alike for how easy it is to use and for how smooth the stroller is when in motion, which is always a plus since it keeps your baby happy and comfortable while on the move. This travel system comes with SnugRide Click Connect 35 Infant Car Seat, a rear-facing car seat that is designed to keep babies both comfortable and safe while riding in the car. This car seat also connects very easily to the stroller portion of the travel system, making transitioning from a car ride to a walk much easier on both you and your child. The stroller also features a suspension system that helps provide a smoother ride when compared to some other products, and the two front wheels swivel to allow for additional maneuverability. The footrest is also adjustable, allowing you to customize it to fit your baby as they grow. The wheels also have a one-touch brake feature that can be especially useful for keeping your stroller in one place or navigating different types of terrain.The stroller also has a large storage compartment underneath and a parents’ tray by the handlebar with two cup-holders. 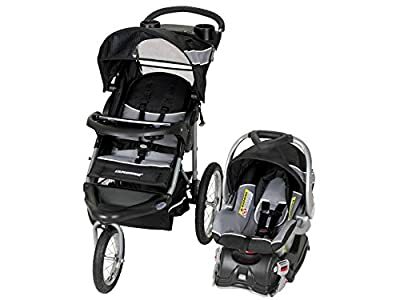 This travel system stroller and car seat combination is similar to other similar products at first glance, but stands apart from the rest once you start comparing the extra features. 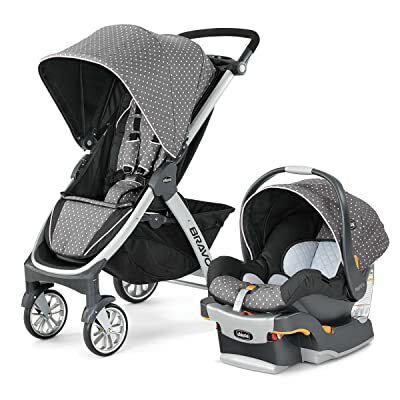 The stroller portion of this travel system not only has a sunshade, but that sunshade has built-in UV protection and is easily deployed with one hand, so you can lower the sunshade without excess hassle even when on the move; this canopy is also made of soft and smooth yet durable materials. 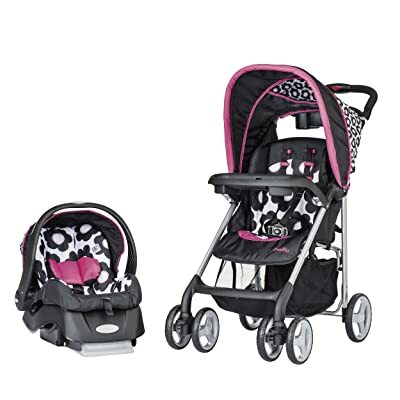 The fabric covers used in this travel system are removable and machine-washable, making it simple to clean and maintain when compared to some other travel system strollers that are harder to keep clean and sanitary. This product is also incredibly lightweight, making it easier to push and carry than other travel systems; it also folds up in one easy motion, making to easy to pack away in your car or closet. The main downside to this travel system is that it is considerably more expensive than other less high-end products, making it a steep investment if you’re operating on a tight baby care budget. This travel system Is a combination of the Britax B-Safe 35 infant car seat (and car eat base) and the Britax B-Agile stroller. The car seat portion is designed with safety in mind, and utilizes Britax’s unique SafeCell Impact Protection system, which is involves many factors integrated together to provide the utmost security and safety for your child. The car seat has a steel frame for durability and strength, the car seat has a thick foam-lined shell to shield your child, and the car seat base itself is specially designed to compress and energy in the event of a collision. This car seat is also designed to take up less room in your vehicle while also being more stable with less side-to-side movement, making it a very safe car seat overall. The stroller portion of this travel system, meanwhile, is known for being light-weight and maneuverable. This stroller is designed to fold-up in one easy motion, and can even be folded up with just one hand. It is also made of incredibly light-weight (but durable) aluminum, making it easy to carry and move. 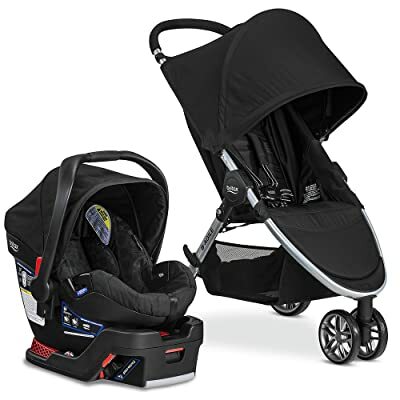 Furthermore, the Click & Go system utilized in the stroller allows any car seat made by Britax to be attached and used in conjunction with the stroller with no extra hassle. Additionally, this stroller has three wheels (two large single wheel int eh back with a smaller double-wheel at the front), which allows for additional maneuverability when compared to larger four-wheeled strollers. The front wheel also swivels, allowing for easier and faster turning, even in tight spaces. This travel system is available in five different colors: black, meadow (green), red, cyan (light blue), and steel (gray). In regards to price, this particular stroller system is squarely in the middle of the price range; it’s more expensive than some of the other choices on this list, but definitely cheaper than more deluxe options like the Uppa Baby Cruz. Overall, if you’re willing to pay a little extra for a travel system that combines incredible safety features with durability and ease of use, this might be a good choice for you. 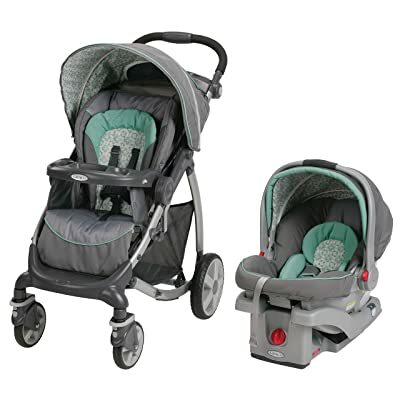 This travel system is very popular, and includes a lightweight stroller and the Embrace LX Infant Car Seat. The stroller portion is easy to fold up; all you need to do is push the red button on the handle and twist to collapse the stroller into a more compact form. The stroller will also remain upright after being folded up, which is very helpful for packing it away in your car or storing it in a closet. The stroller also has Easy-Lock brakes; they are on both the front and back wheels, and can be deployed with just a tap of your foot. Additionally, the parent tray by the stroller handle comes with a built-in storage compartment where you can keep your phone, keys, or anything else you might need. The five-point harness on the seat is adjustable to accommodate your child’s changing height as they grow and develop, the stroller seat itself is adjustable as well (and even reclines! ), and the overhead canopy has a peek-a-boo window so you can keep an eye on your baby at all times. The car seat portion of this travel system also features an adjustable five-point safety harness that can be altered to match your child’s height, and multiple reclining options; the car seat base even has a built-in indicator to keep track of the reclining levels. 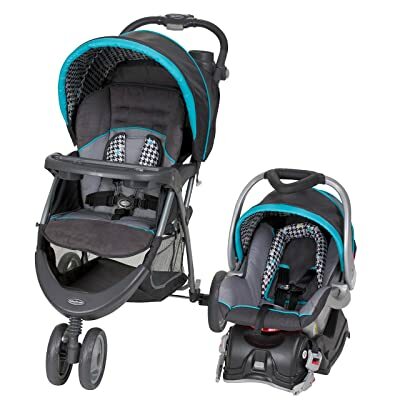 Overall, this is a good choice if you want a travel system that will last throughout your baby’s development; thanks to the adjustable harnesses in both the car seat and the stroller, this travel system can be used as your baby grows, which saves you the trouble of buying another product in the future. The main downside to this travel system is that, despite its incredible popularity among both parents and caregivers, it has been temporarily discontinued by the manufacturer and must be bought used or from second-hand sources until production resumes; because of this, pricing can vary widely depending on the seller. This travel system, like the others, comes with a stroller and a car seat (which in turn comes with its own car seat base). The stroller portion has three wheels for better maneuverability, a five-point safety harness to keep your baby safe and secure, and a well-padded seat for comfort. This product also comes with a specially designed cushion for head and neck support that can be used in either the stroller or the car seat. Furthermore, the car seat has been built with energy-absorbing foam for extra protection and stability. Additionally, the parent tray by the stroller handle comes with two deep cup holders, the handle itself is height-adjustable (a definite plus if you, your partner, or caretaker take turns using the stroller with your child), the canopy has a peek-a-boo window, and the entire stroller folds up flat for easy storage or transport. This product is available in two color options, Hound’s Tooth and Paisley. 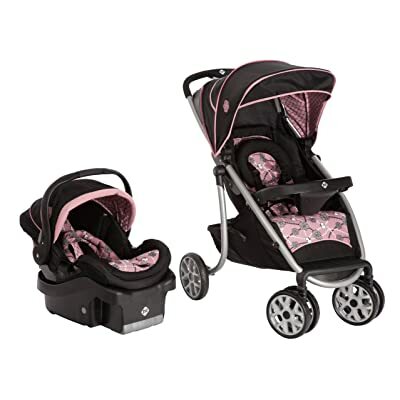 Also, the pricing is reasonable, making this a good selection if you want a good travel system that has all the necessary features without having to pay outrageous prices. We hope that the information we’ve provided for you in this article will be helpful to you on your own search to find the perfect travel system for yourself and your family. If you have any additional questions or information you’d like to share with us, please feel free to leave a comment below. We love hearing from our loyal readers about their own experiences! Thanks “Eva” for your more informative post.This content really effective and helpful for new parents to choose right stroller for his/her baby.I think Britax B-Agile & B-Safe 35 Travel System is looking gorgeous.